When dealing with cases involving the Servicemembers Civil Relief Act, military affidavits are a crucial part of the package needed to prevail in court. The SCRA guarantees active-duty military members certain rights. One protection addresses court cases. Specifically, there is a protection if a servicemember cannot appear in court to defend him or herself. When this applies depends on what kind of case it is. For example, active-duty servicemembers taken to court over missed rent payments rarely risk a judgment entered against them for not appearing. The SCRA often permits servicemembers to present their argument in court or pay off debts they may have accrued. However, the SCRA doesn’t extend the right to every type of legal proceeding servicemembers could face. North Carolina’s Surry County Court dealt with the issue as it applies to family law and other cases. It clarified that there is a military affidavit requirement for maintaining a court case against an active-duty military member in almost every civil matter. What happens if servicemembers can’t appear? This North Carolina case addresses what happens if a servicemember is unable to attend his or her court hearing due to active-duty military status. In many cases, servicemembers need to submit a military affidavit outlining the facts and circumstances surrounding the case. Judges can also request copies of the soldier’s pay statements and additional financial or relevant documents. This helps paint a clear picture of the case, in order to help the judge fashion an adequate ruling. A military affidavit can also help establish the timeline of service. Then, the court can set an appropriate hearing date — when the servicemember can attend. The military affidavit covers several key questions. First, it answers whether the defendant is in active-duty military status. It also asks how the plaintiff verified the military status. According to the North Carolina-based media outlet The Mount Airy News, the Surry County Court decision deals directly with all civil proceedings involving servicemembers. While a military affidavit has been required for monetary judgments, the new decision expands the need for this document to other civil cases — and they require a North Carolina version of the military affidavit, as do many states. The affidavits for all states are available from the Servicemembers Civil Relief Act Centralized Verification Service. While this ruling is beneficial for servicemembers — it helps them avoid forfeiting court cases for not appearing — it has created some confusion within the legal systems as to when plaintiffs need the affidavit. The Mount Airy News reported that courts were experiencing backlogs in some civil proceedings, including divorces, because the military affidavits were missing. The Surry County Court is printing stacks of military affidavits (also called “non-military affidavits”) to leave in courtrooms and offices. That way, attorneys and servicemembers can easily get and sign the form before proceeding with their cases, after they have conducted the research necessary to determine military status. This Surry County Court ruling may set a precedent. While it applies only to this region in North Carolina, the decision may have widespread consequences in other states. Additional courts may require military affidavits for all civil proceedings. This is something that every lawyer, judge and servicemember should keep in mind. In fact, the default should be to present a military affidavit in all proceedings. Even judges need to stay keenly aware of the protections afforded by the SCRA. The Supreme Court of North Carolina took a judge to task when allegations were made that the SCRA issue was not adequately addressed. The goal of this decision is to ensure servicemembers don’t lose if they can’t appear due to active-duty status. In most courts across the country, the SCRA ensures this doesn’t happen, albeit mainly for monetary judgments. Based on the court ruling, this won’t happen in Surry County either, for all civil proceedings. Changes such as the one at the Surry County Court don’t happen overnight. But it’s critical to stay abreast of any modifications that are made, and make note of when they take place. More documentation is better, as far as the courts are concerned. Enlisting the help of a third-party agency in identifying servicemembers can help speed the process. 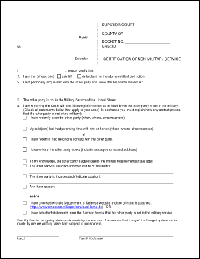 Stay on course by having the proper military affidavits in hand before going to court.